For the Bolivian province, see Gran Chaco Province. For the Argentine province, see Chaco Province. For the region of Paraguay, see Chaco (Paraguay). The Gran Chaco or Dry Chaco is a sparsely populated, hot and semi-arid lowland natural region of the Río de la Plata basin, divided among eastern Bolivia, western Paraguay, northern Argentina and a portion of the Brazilian states of Mato Grosso and Mato Grosso do Sul, where it is connected with the Pantanal region. This land is sometimes called the Chaco Plain. The name Chaco comes from a word in Quechua, an indigenous language from the Andes and highlands of South America. The quechua word chaqu meaning "hunting land" comes probably from the rich variety of animal life present throughout the entire region. The Gran Chaco is about 647,500 km² (250,000 sq mi) in size, though estimates differ. 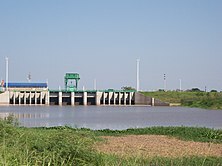 It is located west of the Paraguay River and east of the Andes, and is mostly an alluvial sedimentary plain shared among Paraguay, Bolivia and Argentina. It stretches from about 17° to 33° South latitude and between 65° and 60° West longitude, though estimates differ. Historically the Chaco has been divided in three main parts: the Chaco Austral or Southern Chaco, south of the Bermejo River and inside Argentinian territory, blending into the Pampa region in its southernmost end; the Chaco Central or Central Chaco between the Bermejo and the Pilcomayo River to the north, also now in Argentinian territory; and the Chaco Boreal or Northern Chaco, north of the Pilcomayo up to the Brazilian Pantanal, inside Paraguayan territory and sharing some area with Bolivia. The Chaco Boreal may be divided in two: closer to the mountains in the west, the Alto Chaco (Upper Chaco), sometimes known as Chaco Seco (or Dry Chaco), is very dry and sparsely vegetated. To the east, less arid conditions combined with favorable soil characteristics permit a seasonally dry higher-growth thorn tree forest, and further east still higher rainfall combined with improperly drained lowland soils result in a somewhat swampy plain called the Bajo Chaco (Lower Chaco), sometimes known as Chaco Húmedo (Humid Chaco). It has a more open savanna vegetation consisting of palm trees, quebracho trees and tropical high-grass areas, with a wealth of insects. The landscape is mostly flat and slopes at a 0.004 degree gradient to the east. This area is also one of the distinct physiographic provinces of the Parana-Paraguay Plain division. The areas more hospitable to development are along the Paraguay, Bermejo and Pilcomayo Rivers. It is a great source of timber and tannin, which is derived from the native quebracho tree. Special tannin factories have been constructed there. The wood of the palo santo from the Central Chaco is the source of oil of guaiac (a fragrance for soap). Paraguay also cultivates mate in the lower part of the Chaco. Large tracts of the central and northern Chaco have high soil fertility, sandy alluvial soils with elevated levels of phosphorus and a topography that is favorable for agricultural development. Other aspects are challenging for farming: a semi-arid to semi-humid climate (600–1300 mm annual rainfall) with a six-month dry season and sufficient fresh groundwater restricted to roughly one third of the region, two thirds being without groundwater or with groundwater of high salinity. Soils are generally erosion prone once the forest has been cleared. In the central and northern Paraguay Chaco, occasional dust storms have caused major top soil loss. The Chaco was occupied by nomadic peoples, notably the various groups making up the Guaycuru who resisted Spanish control, often with success, of the Chaco from the 16th until the early 20th century. Prior to national independence of the nations that compose the Chaco, the entire area was a separate colonial region named by the Spaniards as Chiquitos. The Gran Chaco had been a disputed territory since 1810. Officially, it was supposed to be part of Argentina, Bolivia and Paraguay, although a bigger land portion west of the Paraguay River had belonged to Paraguay since its independence. Argentina claimed territories south of the Bermejo River until Paraguay's defeat in the War of the Triple Alliance in 1870 established its current border with Argentina. 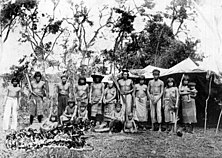 Over the next few decades, Bolivia began to push the natives out and settle in the Gran Chaco, while Paraguay ignored it. Bolivia sought the Paraguay River for shipping oil out into the sea (it had become a land-locked country after the loss of its Pacific coast in the War of the Pacific), and Paraguay claimed ownership of the land. This became the backdrop to The Gran Chaco War (1932–1935) between Paraguay and Bolivia over supposed oil in the Chaco Boreal (the aforementioned region north of the Pilcomayo River and to the west of the Paraguay River). Eventually, Argentine Foreign Minister Carlos Saavedra Lamas mediated a cease fire and subsequent treaty signed in 1938, which gave Paraguay three quarters of the Chaco Boreal and gave Bolivia a corridor to the Paraguay River with the ability to use the Puerto Casado and the right to construct their own port. In the end, no oil was found in the region. Mennonites immigrated into the Paraguayan part of the region from Canada in the 1920s; more came from the USSR in the 1930s and immediately following World War II. These immigrants created some of the largest and most prosperous municipalities in the deep Gran Chaco. The region is home to over nine million people, divided about evenly among Argentina, Bolivia, Brazil, and including around 100,000 in Paraguay. The area remains relatively underdeveloped, In the 1960s, the Paraguayan authorities constructed the Trans-Chaco Highway and the Argentine National Highway Directorate, National Routes 16 and 81, in an effort to encourage access and development. All three highways extend about 700 km (430 mi) from east to west and are now completely paved, as are a network of nine Brazilian highways in Mato Grosso do Sul State. 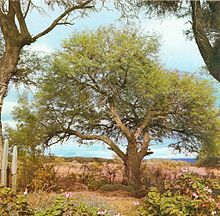 An Algarrobo, white carob tree, in the Gran Chaco area of Argentina. This prized shade tree is common to the area. The Gran Chaco has some of the highest temperatures on the continent. It has high biodiversity, containing around 3,400 plant species, 500 birds, 150 mammals and 220 reptiles and amphibians. The floral characteristics of the Gran Chaco are varied given the large geographical span of the region. The dominant vegetative structure is xerophytic deciduous forests with multiple layers including a canopy (trees), sub-canopy, shrub layer and herbaceous layer. There are ecosystems such as riverine forests, wetlands, savannas, and cactus stands as well. At higher elevations of the eastern zone of the Humid/Sub-humid Chaco there are transitional mature forests from the wet forests of Southern Brazil. These woodlands are dominated by canopy trees such as Handroanthus impetiginosus and characterized by frequent lianas and epiphytes. This declines to seasonally flooded forests, at lower elevations, that are dominated by Schinopsis spp., a common plains tree genus often harvested for its tannin content and dense wood. The understory comprises bromeliad and cactus species as well as hardy shrubs like Schinus fasciculatus. These lower areas lack lianas but have abundant epiphytic species like Tillandsia. The river systems that flow through the area, such as the Rio Paraguay and Rio Parana allow for seasonally flooded semi evergreen gallery forests that hold riparian species such as Tessaria integrifolia and Salix humboltiana. Other seasonally flooded ecosystems of this area include palm dominated (Copernicia alba) savannas with a bunch grass dominated herbaceous layer. To the west, in the Semi-Arid/Arid Chaco, there are medium-sized forests consisting of Aspidosperma quebracho-blanco and Schinopsis quebracho with a slightly shorter subcanopy made up of several species from the Fabaceae family as well as several arboreal cacti species that distinguish this area of the Chaco. There is a scrub-like shrub and herbaceous layer. On sandy soils, the thick woodlands turn into savannas where the aforementioned species prevail as well as species like Jacaranda mimosifolia. The giant Stetsonia coryne, found throughout the western Semi-Arid/Arid region becomes very conspicuous in these sandy savannas. There are various upland systems of plant associations that occur throughout the Gran Chaco. The Highlands of the Argentinian Chaco are made up of, on the dry, sunny side (up to 1800m), Schinopsis haenkeana woodlands. The cooler side of the uplands hosts Zanthoxylum coco (locally referred to as Fagara coco) and Schinus molleoides (locally referred to as Lithrea molleoides) as the predominant species. Other notable species include Bougainvillea stipitata, and several spp. from Fabaceae. The Paraguyan uplands have other woodland slope ecosystems, notably, those dominated by Anadenanthera colubrina on moist slopes. Both of these upland systems, as well as numerous other Gran Chaco areas, are rich with endemism. Faunal diversity in the Gran Chaco is high as well.The Gran Chaco has high levels of biodiversity, containing around 3,400 plant species, 500 birds, 150 mammals and 220 reptiles and amphibians. Animals typically associated with tropical and subtropical forests are often found throughout the eastern humid Chaco, including jaguars, howler monkeys, peccaries, deer, and tapirs. Edentate species, including anteaters and armadillos, are readily seen here as well. Being home to at least ten species, the Argentinian Chaco is the location of the peak diversity for the armadillo, including species such as the nine-banded armadillo (Dasypus novemcinctus) whose range extends north to the southern US, and the southern three-banded armadillo (Tolypeutes matacus). The pink fairy armadillo (Chlamyphrous truncatus), is found nowhere else in the world. The giant armadillo (Priodontes maximus), while not found in the eastern humid Chaco, can be seen in the drier arid Chaco of the west. Some other notable endemics of the region include the San Luis tuco-tuco (Ctenomys pontifex). This small rodent is only found in the Argentinian Chaco. All of 60 species of Ctenomys are endemic to the continent of South America. The Chacoan peccary (Catagonus wagneri), locally known as tauga, is the largest of the three peccary species found in the area. This species was thought to be extinct by scientists until 1975, when it was recorded by Dr. Ralph Wetzel. Due to the climatic regime of the Gran Chaco, herpetofauna are restricted to moist refugia in various places throughout the chaco. Rotting logs, debris piles, old housing settlement, wells, and seasonal farm ponds are examples of such refugia. The black-legged seriema (Chunga burmeisteri), blue-crowned parakeet (Aratinga acuticadauta), Picui ground dove (Columbina picui), guira cuckoo (Guira guira), little thornbird (Phacellodomus sibilatrix) and many-colored Chaco finch (Saltaitricula multicolor) are notable of the 409 bird species that are resident or breed in the Gran Chaco. 252 of these Chaco species are endemic to South America. In September 1995, the Kaa-Iya del Gran Chaco National Park and Integrated Management Natural Area was established in an area of the Chaco in Bolivia. It is administered and was established solely by the indigenous peoples, including the Izoceño Guaraní, the Ayoreode, and the Chiquitano. The Chaco is one of South America's last agricultural frontiers. 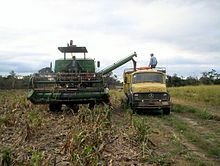 Very sparsely populated and lacking sufficient all-weather roads and basic infrastructure (the Argentinian part is more developed than the Paraguayan or Bolivian part), it has long been too remote for crop planting. The central Chaco's Mennonite colonies are a notable exception. Two factors may substantially change the Chaco in the near future: low land valuations and the region's suitability to grow fuel crops. Suitability for the cultivation of Jatropha has been proven.Sweet sorghum as an ethanol plant may prove viable, too, since sorghum is a traditional local crop for domestic and feedstock use. The feasibility of switchgrass is currently being studied by Argentina's INTA, as is the Karanda’y palm tree in the Paraguayan Chaco. While advancements in agriculture can bring some improvements in infrastructure and employment for the region, loss of habitat / virgin forest is substantial and will likely increase poverty. Paraguay, after having lost more than 90% of its Atlantic Rainforest between 1975 and 2005, is now losing its xerophytic forest (dry forests) in the Chaco at an annual rate of 220,000 hectares (540,000 acres) (2008) In mid-2009 a projected law, initiated by the Liberal Party, that would have outlawed deforestation in the Paraguayan Chaco altogether, "Deforestacion Zero en el Chaco" did not get a majority in the parliament. Deforestation in the Argentinian part of the Chaco amounted to an average of 100,000 hectares (250,000 acres) per year between 2001 and 2007  According to Fundación Avina, a local NGO, on average, 1130 hectares are cut down per day – this equals 2300 football fields. The soy plantations not only eliminate the forest, but also other types of agriculture as well. Indigenous communities are losing their land to agrobusinesses. Since 2007, there is a law which is supposed to regulate and control the cutting of timber in the Gran Chaco, but illegal logging continues. Among the profiteers of the newly created agricultural areas in the Paraguayan Gran Chaco are U.S.-based agribusinesses Cargill Inc., Bunge Ltd. and Archer Daniels Midland Co.. The following Argentine provinces, Bolivian and Paraguayan departments and Brazilian states lie in the Gran Chaco area, either entirely or in part. ^ "The Gran Chaco". WWF. Retrieved 2017-07-06. The Gran Chaco was one of the last frontiers in South America – but agricultural development, largely driven by soy, is gathering pace. ^ a b What is Gran Chaco vegetation in South America? I. A review. Contribution to the study of flora and vegetation of Chaco. V. Candollea, 48: 145-172, 1993. ^ a b Napamalo: The Giant Anteater of the Gran Chaco, 2003. ^ Conservation ecology of armadillos in the Chaco region of Argentina, 1: 16-17, Edentata, 1994. ^ Guiá de los Mamiferos Argentinos, 19840. ^ Catagonous, an "extinct" peccary, alive in Paraguay, 189:379-381, Science, 1975. ^ ECOLOGICAL NOTES ON PARAGUAYAN CHACO HERPETOFAUNA, 12(3), 433-435, Journal of Herpetology, 1978. ^ A Zoogeographic Analysis Of The South American Chaco Avifauna, 154(3), 165-352,Bulletin of the American Museum of Natural History, 1975. ^ "Impenetrable olvido (..tan bajo el valor de la tierra que con dos campañas, sobra..)" (in Spanish). AMBIENTE-ARGENTINA. Archived from the original on 2012-07-09. Retrieved 2008-09-09. ^ "Cada vez más Uruguayos compran campos Guaranés" (PDF) (in Spanish). Consejo de Educacion Secundaria de Uruguay. 26 June 2008. Archived from the original (PDF) on 25 February 2009. ^ "Jatropha en el Chaco" (in Spanish). Diario ABC Digital. Retrieved 2008-09-09. ^ "Jatropha Chaco" (in Spanish). Incorporación del cultivo Jatropha Curcas L en zonas marginales de la provincia de chaco. Archived from the original on 2008-10-11. Retrieved 2008-09-09. ^ "Varias iniciativas están en marcha con vistas a la producción de biodiesel" (in Spanish). RIEDEX / Ministerio de Industria y Comercio (de Paraguay). Archived from the original on 2009-03-08. Retrieved 2008-09-09. 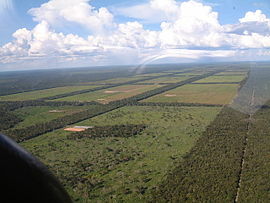 ^ "Deforestation in Paraguay: Over 1500 football pitches lost a day in the Chaco". World Land Trust. 30 November 2009. ^ H. Ricardo Grau, Ignacio Gasparri (27 June 2008). "Deforestation and fragmentation of Chaco dry forest in NW Argentina (1972–2007)". Archived from the original on 1 February 2013. ^ MacDonald, Christine (2014-07-28). "The Tragic Deforestation of the Chaco". Rolling Stone. Retrieved 2017-07-06. "Chaco". Terrestrial Ecoregions. World Wildlife Fund. "Humid Chaco". Terrestrial Ecoregions. World Wildlife Fund. The website La Plata Basin - Gran Chaco seeks to enhance the complementarity between institutional capacities and ongoing projects in the region so as to strengthen synergies, develop replicable and scalable initiatives, and improve participatory management with communities from the perspective of sustainability and equity.